This art of selective forgetting is one the Australian media is particularly good at. Remembrance Day passed with scarcely a mention that this year, November 11 marked the 35th anniversary of the constitutional coup — the dismissal of the elected government of Labor prime minister Gough Whitlam by another governor general, John Kerr. Like many, I well remember that day. My mother rang to tell me the news, and like her, I was astounded. How could the governor-general dismiss an elected government? Didn’t we live in a democracy? Didn’t the Australian people elect their government? I flexed off early from my public service job and attended a huge meeting in Brisbane’s King George Square. I heard impassioned speeches calling for a general strike and rumours (which turned out to be true) that Kerr was moving to call out the army. I wondered what the army would do (I wonder). Would they act like Chilean military dictator General Pinochet, whose US-backed overthrow of the overthrow of the elected left-wing government of Salvador Allende was accompanied by the massacre of thousands? Former Australian prime ministers Robert Menzies, Howard Holt, John Gorton, Bob Hawke and John Howard all compliantly sent Australian troops to fight US wars. But in the early 1970s, Whitlam’s government had the courage to bring Australian soldiers home from the US war in Vietnam. For this audacious action, Labor would never be forgiven by then-US president Richard Nixon, the CIA, Rupert Murdoch, the CIA, and corrupt conservative premiers Bob Askin (NSW) and Joe Bjelke-Petersen (Queensland) — who all hated Whitlam as though he were Che Guevara. 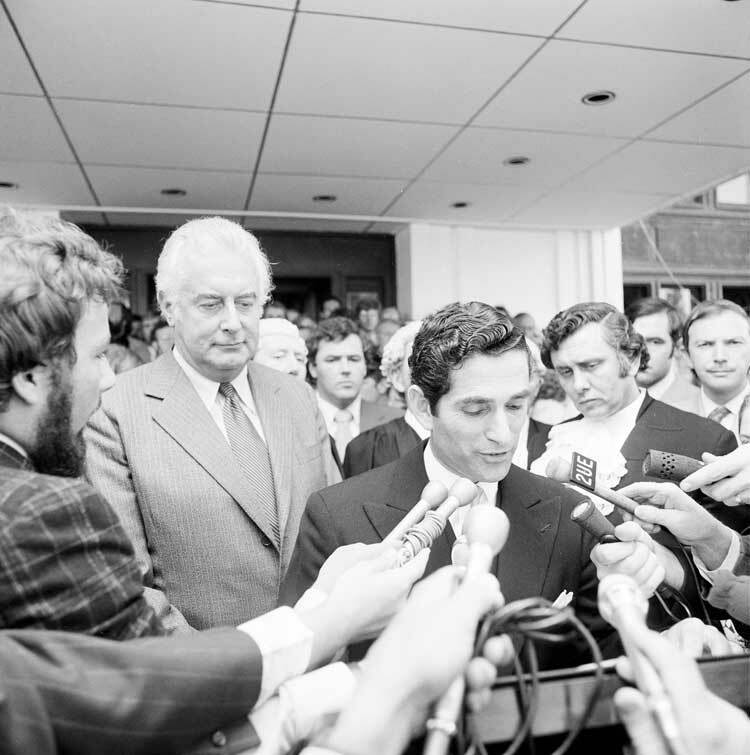 Whitlam’s election in 1972 began a short-lived era in which the stated aims of the new Labor government were to promote equality and involve the people in decision-making processes. Within two weeks of Whitlam’s election, conscription was abolished and draft resisters released from jail. Voting rights were extended to all Australians over 18, and university fees abolished. Whitlam’s youth constituency also gained community radio stations, and the Whitlam government intended to decriminalise marijuana. Aborigines were granted land rights in the Northern Territory. Whitlam was less subservient than his Liberal predecessors to Washington’s foreign policy directions. He took a more critical line in foreign policy, condemning Nixon’s 1972 bombing offensive against North Vietnam and warned he might draw Indonesia and Japan into protests against the bombing. The People’s Republic of China was recognised and the Whitlam government spoke up in the United Nations for Palestinian rights. The French were condemned for testing nuclear weapons in the South Pacific, and refugees fleeing the CIA-backed coup in Chile were welcomed. Nixon and the CIA found such independence intolerable. After Whitlam was re-elected in 1974, and Jim Cairns became his deputy, Nixon ordered the CIA to review US policy towards Australia. Although the CIA’s response to Nixon has never been released, it seems it began a covert operation to destabilise the Whitlam government began then. The puppet masters who led the coup were Ted Shackley and Marshal Green. Nixon appointed Green as US Ambassador to Australia in 1973. Nick-named “the coup-master”, Green had been involved in several countries where the CIA had masterminded coups, such as Indonesia (1965) and Cambodia (1970). Green’s goals were to maintain US bases in Australia and to protect US economic interests. Green let it be known that if the Labor government honoured one of its key election pledges to reclaiming ownership of oil refineries and mining industries, the US would respond. Green carefully cultivated the Fairfax, Murdoch and Packer dynasties that controlled the Australian media. Ted Shackley, known as the “Blond Ghost”, joined the CIA in 1951. Over the next two decades, he emerged as the agency’s “dirty tricks” specialist, directing the CIA’s campaign against Cuba and Fidel Castro’s government in 1962. In 1966 he became Chief of Station in Laos and directed the US secret war there — earning his other nickname, “the Butcher of Laos”. In 1971, he became head of the CIA’s Western Division (covering North and South America) where he plotted the overthrow of Allende. In 1974, Shackley became head of the Eastern Division of the CIA, covering Asia and Australia. Shackley’s speciality was financing black operations through the drug trade and he learned the dark art of running drug armies during the secret war in Laos. One of his foot soldiers in Laos was Michael Hand, co-founder of the Nugan Hand bank. Michael Hand helped forge documents used by the media to discredit the Whirtlam government, while his partner Frank Nugan was the conduit for CIA money to the Liberal Party. Millions of dollars flowed to the conservative parties via Nugan Hand. Shackley played a key role in the security crisis of November 1975, which revolved around the US military base at Pine Gap. Whitlam had threatened that if the US tried to “bounce” his government, he would look at the presence of US bases in Australia. The lease for Pine Gap was due for renewal in December 1975. On 10 November 1975, the day before Whitlam was sacked, Shackley sent an extraordinary cable from the CIA to ASIO’s director general, threatening to remove ASIO from the British-US intelligence agreement because he considered Whitlam a security threat. The cable was published by the Financial Review in 1977 and has been widely reprinted. It shows Shackley’s involvement in the security crisis. Shackley was furious that Whitlam had accused the CIA of funding the opposition conservative parties and had claimed CIA money was being used to influence domestic Australian politics. In particular, Whitlam was asking questions about the close relationship between Richard Stallings, who ran the so-called joint facility at Pine Gap, and National Party leader Doug Anthony. “The CIA has grave concerns as to where this type of public discussion may lead”, Shackley’s cable said. For the Australian media, the message of Remembrance Day 2010 was clear: sleeping dogs must be allowed to lie. There could be nothing nobler to aspire to than the service of our imperial overlords, and to remind the Australian people that these imperial overlords had subverted a democratically elected government was well off message. Brilliantly written article and was most enlightening. It now explains the current government and their actions. I always called Australia ‘Little America’, now I know why. Danny Casolaro – Murder or Suicide?